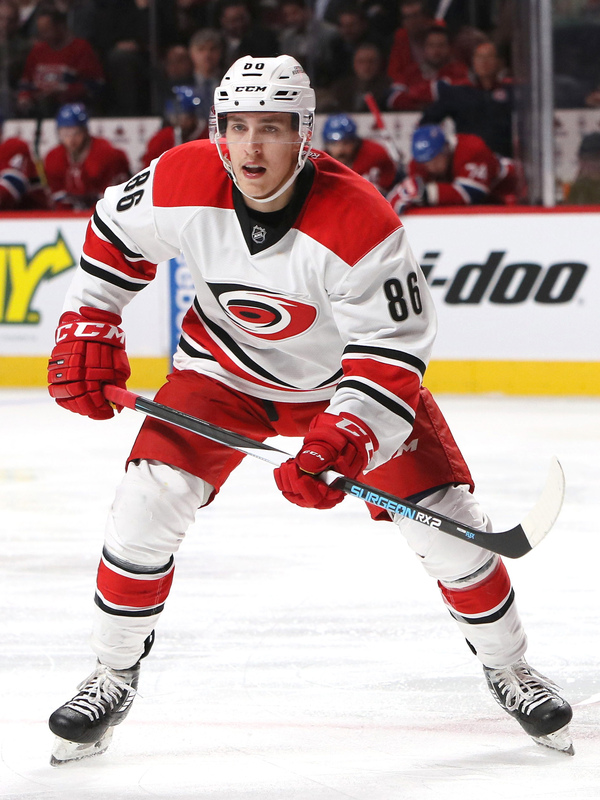 Teuvo has improved every year of his NHL career and has established himself as a cornerstone forward for the Hurricanes now and into the future. He has shown that he is capable of adapting and expanding his role with our team, becoming a key penalty killer for Rod [Brind’amour] this season. He’s still just 24 years old and we believe he will only continue to grow as a player. Teravainen was acquired by the Hurricanes in a 2016 transaction that used their cap space as an asset, taking on Bryan Bickell’s contract from the Chicago Blackhawks alongside the young forward. In his first season in Carolina the part-time center recorded 15 goals and 42 points, but really broke out in 2017-18 when he was moved to the wing. Teravainen finished with 64 points last season, just one behind Sebastian Aho for the team lead. That kind of production, when added to the 39-point season he’s working on so far in 2018-19, made him a prime candidate for a long-term extension in Carolina. This extension buys out just two years of unrestricted free agency, allowing the Hurricanes to keep the cap hit relatively low while still locking Teravainen up through his prime. His contract actually compares directly to one that the Hurricanes just acquired in Nino Niederreiter, who signed a very similar five-year contract in 2017 that carries a $5.25MM cap hit. Those two project to be Carolina’s top earning forwards next season, at least until Sebastian Aho signs his next deal which will likely also be of the long-term variety. Carolina is trying to build a forward core that can stay and grow together over the next few years, and there was little doubt that Teravainen would be a part of that. Getting his deal done early also signals to the rest of their group that they’re willing to hand out reasonable long-term deals, something that was in question after failing to get anything done with Elias Lindholm before trading him out of town. Next on the agenda could be Micheal Ferland, who is a pending unrestricted free agent and top trade chip, but one the Hurricanes have indicated they would like to re-sign if possible. Great extension. Assuming he maintains the level of play he’s been at since the start of last season, this could be one of the best bargains in the league over the next few years. Carolina would’ve probably liked a bit more term, but at least they can reasonably expect surplus value over the life of this deal. He should garner Selke consideration as early as this year. Wingers don’t generally get respect when it comes to Selke nominations. Only 6 wingers have ever won it and 3 of them(Jere Lehtinen, Sergei Fedorov and Bob Gainey) happened to be arguably the 3 greatest defensive wingers in history. In the last 6 seasons, only David Backes, Marian Hossa and Mark Stone have cracked the top 5 and they each finished 5th in voting. Another Stan Bowman trade marked down in the books as a big, fat minus. Teravainen, much like Byfuglien, Panarin, Schmaltz, Hinostroza, Leddy, Kempny, Danault and a others around the league were traded for far worse returns and the Hawks are now reaping the benefits of his incompetence. He inherited a potential dynasty from Dale Tallon and he’s squandered it one move at a time. As for the Canes though, I’m happy he’s worked out for them, and it looks like they’re building some quality depth up and down their roster.